Chicago is one of North America’s most popular traction and tourist destinations and ERA’s 2011 convention city. The Greater Chicago area is home to four outstanding electric railroad museums and heritage operations, one of the nation’s oldest and most comprehensive rapid transit and commuter rail networks as well as world-class museums and shopping for your non-railfan spouse! 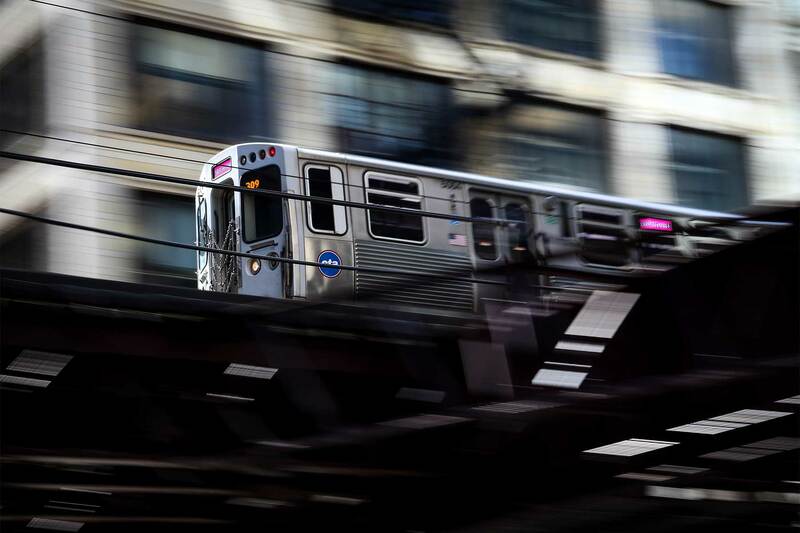 The Chicago Transit Authority (CTA) “L” network spans eight routes, 224 track miles, with over 2,100 daily train trips carrying 650,000 passengers a day. The Metra network encompasses 10 diesel and one electric commuter line with 702 weekday trains carrying 307,000 passengers a day. The Greater Chicago area is also home to one of the last remaining interurban lines, the South Shore Line, connecting the 90 miles between Chicago and South Bend, Indiana. Join your ERA friends in Chicago, September 1 through 6, and experience many of these traction highlights with us. The Chicago Marriott O’Hare, 8535 West Higgins Road in Chicago’s northwest side will serve as our convention headquarters. 24-hour “L” service via CTA’s Blue Line Cumberland Station is located just across the hotel’s parking lot and provides one-seat access to Chicago’s O’Hare International Airport, Chicago’s Magnificent Mile and the Loop district. The Marriott is a full-service hotel and features on-site health club, indoor and outdoor pool, and whirlpool facilities. Single, double and twin accommodations are priced at just $74 per night (plus 15.4% tax). Our annual slideshow and banquet will be held on the premises. To avoid missing a single convention activity, plan on arriving no later than the afternoon of Thursday, September 1. We’ll kick off the convention with our annual slideshow at the Marriott. Doors open at 7:30 pm and the slideshow begins at 8:00 PM Our speaker will be Ray DeGroote, longtime ERA member and board member of Chicago’s Central Electric Railfans’ Association (CERA). Ray will present “Americans Abroad”, featuring U.S. streetcars that were later sold and used in other countries. Systems featured will include NYC Third Avenue cars that went to Vienna, Sao Paulo, Lima and Mumbai, Los Angeles PCCs in Cairo, and Toronto PCCs in Alexandria to name just a few. Ray is considered one of the deans of traction photography. You will also have an opportunity to meet local traction enthusiasts and reacquaint yourself with other ERA and CERA members (many of you belong to both groups). The fare for this trip includes a box lunch from the Corner Bakery Cafe in Chicago’s Loop district that will be provided to you upon our morning departure from Chicago. Make sure to indicate your meal preferences on the ticket order form. Please allow sufficient time to travel from the Marriott to reach Millennium station on time. While “L” train travel from the Cumberland Station near the Marriott to the Loop can require up to 50 minutes, we suggest departing the Marriott around 9:00 am to ensure on-time arrival at Millennium Station and an opportunity to photograph the Metra Electric Line trains also operating there. Our bus leaves the Marriott at 8:30 am to visit the Illinois Railway Museum (IRM). IRM represents North America’s largest operating traction and mainline railroad museum, with over 300 pieces of equipment (over 100 operating under electric power). Significant collections include 40 pieces of Chicago streetcar, rapid transit and trolleybus equipment, 19 from Milwaukee, as well as equipment from the iconic North Shore Line and Illinois Terminal interurban and the historic Chicago, Burlington & Quincy Nebraska streamlined Zephyr train set. We will be able to enjoy rides on either a one-mile streetcar loop or a five-mile railroad line (10-mile round trip). You may purchase lunch on-site at IRM during our visit. We will leave the museum in the afternoon to return to the Marriott by around 6:00 pm in time for the ERA Annual Banquet. ERA’s Annual Banquet will be held in the evening in a private room at the Chicago Marriott O’Hare Hotel. An hour-long informal reception and cash bar will begin at 7:00 pm, and dinner will follow promptly at 8:00 PM Our guest speakers are Graham Garfield and Bruce Moffat. Graham and Bruce have served on the CERA board and are exceptionally well versed on the Chicago transit scene. Graham and Bruce’s presentation will deal with Chicago’s storied transit history, current operations and future plans. Graham has published several articles on Chicago transit history and station design published in First & Fastest magazine, and is also the founder and current webmaster of the Chicago-L.org website. Bruce has published several books including three currently available on Amazon.com, The “L”: The Development of Chicago’s Rapid Transit System, 1888–1932, Forty Feet Below: The Story of Chicago’s Freight Tunnels and The Chicago Tunnel Story: Exploring the Railroad “Forty Feet Below” (Bulletin 135 of the Central Electric Railfans’ Association). We will leave the Marriott at 8:30 am by chartered bus to visit the heritage streetcar operation in Kenosha, Wisconsin and the East Troy Electric Railroad Museum. In Kenosha, we will view, photograph and ride the Kenosha Transit Electric Streetcar, a two-mile streetcar loop which connects the local commuter rail station to downtown attractions, a transit center, and the new 64-acre Harborpark residential development situated on the Lake Michigan shore. Service is provided using five refurbished Toronto PCC cars, each painted in a different color scheme representing PCCs operating in Chicago, Cincinnati, Toronto, Johnstown and Pittsburgh. The Kenosha operation’s entire right-of-way has been carefully landscaped, and features extensive use of New Orleans-style “neutral ground” track, with grass covering the entire roadbed except for the rails themselves. The cars are ADA-accessible. Next stop is the East Troy Electric Railroad Museum in East Troy, Wisconsin. This museum features a collection of 25 streetcars, interurbans and rapid transit cars from the Chicago, Milwaukee, Twin Cities, Toronto and Philadelphia metropolitan areas, many of which are operable. The streetcars, rapid transit cars, and interurbans make a 10-mile round trip between East Troy and The Elegant Farmer, Wisconsin’s largest farm market, at Highways J and ES near Mukwonago. The highlight of our visit to this museum will be lunch served aboard one of East Troy’s two Art Deco dining cars, included as part of your fare for this trip. We will return by bus to the Marriott at approximately 6:30 pm. We will leave the Marriott by chartered bus at 8:30 am for a visit to the Fox River Trolley Museum based in South Elgin, Illinois. The museum’s collection includes 28 cars operating on a portion of the former Chicago, Aurora and Elgin Railway (CA&E), one of Chicago’s storied interurban lines. In addition to streetcars, interurbans and rapid transit cars from the Chicago city and interurban operations, the museum features cars from the CA&E. We will be able to ride and photograph equipment on a four-mile round trip, traveling along the banks of the scenic Fox River and in the Jon J. Duerr Forest Preserve. After our museum visit, we will be dropped off at Forest Park station for a fan trip on the Chicago Transit Authority “L” system. Series 2200 “L” cars, the oldest cars still in operation, have been requested for this trip. This tour will be approximately four hours in length. At the conclusion of the trip, you will return to the Marriott on your own. We will leave the Marriott by chartered bus at 8:30 am for a visit to CTA’s Skokie Shops. Skokie Shops services rail cars from throughout the CTA network. The shops are located along CTA’s Yellow Line, formerly the “Skokie Swift”, a 5.1-mile non-stop shuttle rail line between Skokie and the Red Line Howard Street terminal on former North Shore line right-of-way. The 1964 startup of this line was one of the federal government’s first successful demonstrations of improved rail service attracting motorists to public transit. The Chicago Marriott O’Hare, 8535 West Higgins Road, is located in Chicago’s northwest side. The hotel offers complimentary transportation to and from O’Hare International Airport running every 15–20 minutes. The hotel can also be accessed by 24-hour service to Cumberland Station on CTA’s Blue Line. The hotel grounds and parking lots are adjacent to and directly accessible by the Cumberland Station. The Blue Line “L” also offers direct access to O’Hare International Airport. Those arriving in Chicago at Union Station should board the O’Hare-bound Blue Line train at Clinton Station and take it to Cumberland Station. Clinton Station is approximately three blocks south of Union Station, with the entrance on Clinton Street under the Eisenhower Expressway viaduct. Those arriving at Midway Airport should take the Orange Line and transfer to the Blue Line at Clark/Line Station. Unlimited ride 3-day Transit Passes can be purchased at O’Hare Airport and Midway Airport “L” stations. One-day passes at $5.75 or three-day passes for $14 can be purchased only at Currency Exchanges, select Jewel and Dominick’s grocery stores, and Walgreens and CVS drugstores. Pay-per-ride Transit Cards (similar to NYC MetroCards) are sold at all CTA “L” stations. Fares can be bought for $5 or more. The base fare is $2.25. For additional information and a full listing of the locations for purchasing both types of fare cards (unlimited ride Transit Passes and pay-per-ride Transit Cards), see CTA Fare Vending Machine Locations. Also, unlimited ride Transit Passes can be purchased online from the CTA Store. Schedule times given in this flyer are subject to change. Announcements will be made to update necessary information during ERA events. Fares shown are those in effect upon the issuing of this flyer and are a summary. For full information, consult the Chicago Transit Authority website. So join us in Chicago for Labor Day weekend 2011! Ride one of North America’s most comprehensive electrified rapid transit, interurban, commuter rail and diesel rail networks and visit the region’s premier traction museums.